Reducing energy consumption and costs is paramount in most companies' financial goals. 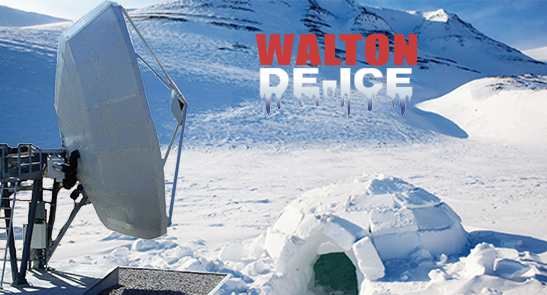 Walton De-Ice is recognized as a company that can provide solutions by protecting antennas from outages due to snow, ice, rain and weather. Those in attendance at IBC will find Walton De-Ice on display at Hall 1, Stand 1.A62 where their team will be sharing their latest in gas and electric heated hot-air Plenum systems for large antennas (3.7 to 32 meters), as well as weather protection solutions such as Ice Quake, Rain Quake, and Snow Shield. Telespazio's Fucino Space Center is a client who has made upgrades with Walton-De-Ice. Telespazio has upgraded its Walton’s Plenum Hot-Air De-Icing systems (Walton De-Ice Plenum, Snow Shield and Ice Quake systems) with Walton’s latest CE-approved gas heaters and Control systems to help provide the highest level of uptime during winter at the Fucino Space Center. At Fucino, Telespazio upgraded seven gateway antennas, ranging in size up to 18 meters in diameter. They are now part of a growing number of facilities in Europe that have recently added or upgraded Walton De-Icing systems. An article in this month’s issue of SatMagazine also provides information for Earth station operators on energy-savings options for de-icing systems, based on the experience of European operator, STN. Jurij Blazin, STN's Director of Engineering commented in the article, "To maximize energy consumption efficiency, we decided to upgrade our systems with Walton De-Ice’s latest gas heaters, which not only reduces costs but also provides redundancy and reliability." Click here to schedule a meeting, or call +1 (951) 683-0930 (USA). Walton De-Ice will also attend SCTE Tech EXPO '16, Booth #229, from September, 26-29, in Philadelphia at the Pennsylvania Convention Center.